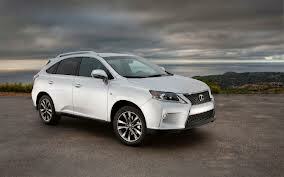 What can one say about the Lexus RX 350 sport-utility vehicle? Itâ€™s a favorite among SUV owners and drivers, has been since it first hit the showroom, and remains a repeat-buyers car. Although the RX may not win any styling design contest, it remains a tried-and-true performer, with luxury and comfort that is first rate. The 2013 RX 350 SUV, now its third year into the third generation has some cosmetic upgrades, as well as refinements to already existing technology. Three versions are available and include the RX350, RX45h and RX350 F Sport, the latter of which is available only the U.S. The new inverted-trapezoid upper and lower grille takes some getting used to, but began to grow on us. Daytime running lights are now located beneath the grille, and new for 2013 are clear headlight clusters that can be outfitted with a choice of HID, LED or halogen lamps. The wheels get a new 19-inch design added, and Lexus has given the RX four new exterior colors: Platinum Silver, Garnet Red, Fire Agate, and Lapis Lazuli. A new steering wheel with varying circumference updates the interior, as does the wood finish. 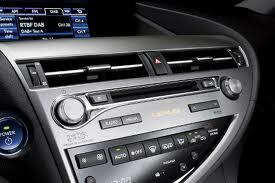 Lexus has designed their â€˜mouse,â€™ the multifunction remote touch interface device so that it is a little user friendly. For the most part, we found it fairly easy to use. Our test RX 350 came equipped with a few options, causing the MSRP of $41,000 to hover near the $50,000 mark. First up are the heated and ventilated front seats ($640); Mark Levinson Premium Surround Sound, single DVD/CD player, HD radio w/iTunes, tagging and 15-speakers (the same sound system in the 450h sedan), $995; Navigation System with Voice Command, Backup camera, Lexus Enform with destination assist and eDestination, App Suite, SiriusXM NavTraffic, NavWeather, Stocks, Sports and fuel prices (1 yr subscription), $2,775; and the Premium Package (leather trim interior, One-touch open/close moonroof, power-folding electrochromatic heated outside mirrors, driverâ€™s seat/steering/mirror memory w/3 settings, $2,260. A driver can become accustomed to such luxury and being without it can be an adjustment. For over-the-road driving the Lexus RX 350 is a great cruiser. EPA fuel economy: 18-20 mpg. OMG (in todayâ€™s texting vernacular) this new Lexus 450h is a dreamboat of a car. Not that the Lexus isnâ€™t known for its cushy ride, bucket list of amenities and a sound system that is one of the best in the industry. This writer practically had to be pried out of the 350h, wanting only to cruise around town and delight in the Sirius/XM Satellite radio through Dolby sound. The redesigned, re-engineered 2013 Lexus 450h is a beautiful sedan, and worth all $68,000 dollars of it. Not something automotive journalists say often-if at all-that a new vehicle is â€˜worthâ€™ what the manufacturer asks for it. A more-than-comfortable, quiet riding sedan, the 450h is a vehicle one could drive for years. As high-tech as the 350h is, it isnâ€™t difficult to learn to operate. 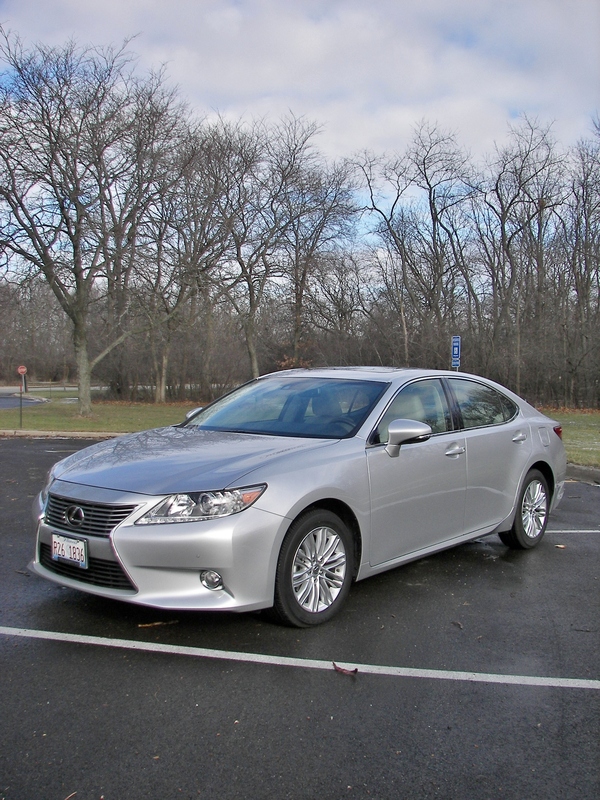 Our Lexus GS 450h sedan came equipped with the usual good stuff, including wood trim. This bold and elegantly re-designed sedan is a combination of styling and the latest technology. Other manufacturers would be hard-pressed to match what Lexus offers, although many try. Itâ€™s no secret that the Lexus brand is todayâ€™s premier benchmark for other contenders in the industry. As bland as their models have been (design-wise), the 2013 GS450 takes a bold leap with the design of their new front grille. This truly modern luxury car is powered by a new, direct-injected 3.5-liter V6 engine, with 306 horsepower and 277 lb-ft of torque to provide im proved fuel economy and performance. Equipped with a six-speed automatic transmission with paddle shifters, the 2013 GS450h is available with either rear-wheel or all-wheel drive. The GS 450h seats up to five passengers, with generous interior space. Standard features on the 350h include so many goodies it would take a page to list them all. Among them, the obvious: Power moonroof, keyless entry with push-button start, dual front airbags/front-rear side-mounted side impact airbags, driverâ€™s and front passenger front knee airbags, Supplemental Restraint System , 3-point safetyÂ belts for all seating positions, whiplash lessening front seats, Vehicle Dynamics Integrated Management w/vehicle stability control, ABS, brake assist and traction control, rain-sensing automatic wipers/backup monitor, Bi-Xenon headlamps (HID),and Safety Connect Automatic Collision Notification. What else would one expect? This vehicle comes fully equipped, so much so, one would be hard-pressed to move into any other sedan after spending any amount of time in the GS450h. There is little to compare, although each manufacturer has its loyal customers, and many hard-core Audi and BMW owners would contest what Lexus offers. Obviously, there are those sport-suspension die-hards who prefer a rougher ride. Maybe in days past. This writer wants to ride in comfort. As alluded to above, the Lexus sound system in the GS450h is top-of-the-line and includes the Lexus Premium Audio System, a navigation system with a new 12.3-inch multimedia display, iTunes, tagging, DVD/CD Player, Bluetooth Technology, USB Audio Plug, SiriuusXM SatelliteÂ Radio with remoteÂ Touch, Advance Voice Recognition, and HD. Sound quality is among the best in the industry, and although as high-tech as they come, the systemâ€™s controls are easily learned and operated. Options on our 450h included Lane Keep Assist & departure Warning System ($500); Luxury Package (heated seats, 18-inch Split-Nine-Spoke Alloy wheelsw/painted silver finish and all-season tires, Bi-LEDÂ headlamp with adaptiveÂ front lighting system (AFS), heated leather interior trim, three-zone automatic climate control, 18-way power front seats w/power adjust extendable lower cushions and butterfly headrests, Lexus MemoryÂ System for front-passengerÂ seat, rear-doorÂ manual sunshades, heated rear seats, $5,645); Pre-collision System (brake, driver, Attn monitor w/closed-eye detection, $2000); cargo net, $64; and trunk mat,$105. Other standard features on the 450h sedan include parking assist, adaptive variable suspension, adaptive front lighting system, and a pre-collision system with dynamic radar cruise control. The controls are intuitive, which isnâ€™t always the case in other high-end vehicles (BMW comes to mind). We enjoyed using the control that operates the audio system. It aids the driver in getting just where he/she wants to be when navigating radio options. By comparison, this writer was in a Mitsubishi product following her week in the 350h and became frustrated by how hard the Mitsu audio system operates. All-new for 2013, the Lexus GS 350h is everything an auto-lover could want. Weâ€™ve no doubt it will fly off the showroom floor. EPA Fuel Economy: 29/34 mpg. While the 2013 Mitsubishi Outlander is not a bad vehicle, it pales in comparison to the other offerings on the market; namely, a Hyundai Santa Fe or Tucson/Kia Sportage. It is a decent looking SUV but feels cheap where itâ€™s noticeable. Simply closing the door makes one wonder how it can possibly compete with a less expensive, better put together small ute. Our test Mitsubishi Outlander 3.0 GT SUV came equipped with many features, including two options: The Touring Package (leather seating surfaces, 710 watt Rockford Fosgate punch premium sound system with nine speakers, including 10-in. subwoofers, power glass sunroof, power driverâ€™s seat, auto-dimming rearview mirror, rear camera system, $2,500), and Navigation/rearview camera (400GB HDD navigation with music server and real time traffic, rearview camera monitor, $2000). Although it would be unfair to compare sound systems in a $68,000 sedan and this $33,000 small SUV, the Mitsu Outlanderâ€™s Rockford audio pales by comparison. First, it is difficult to operate. This writer found it incredibly frustrating to try and move from one station to another. One nice feature, however, on Mitsuâ€™s sound system is the ability to sync (remember) the CD that has played once. It becomes programmed into the system, thus eliminating the need to carry the CD with you. It also opens up to a hiding CD port. Good safety feature. Since last redesigned, the Mitsubishi Outlander is now in its seventh model year. Some regard the Outlander as Mitsubishi’s â€œbest and brightest product.â€ This may illustrate, we fear, what a dire situation Mitsubishi finds itself in concerning the U.S. automotive market. With all its current competition (including VW Tiguan and Subaru Forester), it is somewhat remarkable that the auto brand that is Mitsubishi can still compete. Were it not for the size and scope of the company worldwide, predictions hover around extinction for the brand in the U.S. market. For 2013, with a redesigned 2014 model waiting to be introduced, the Outlander hangs on by tweaking a few features, here and there. Performance, and presentation have been updated, enough to make this SUV feel a little fresher. Getting a mild restyle, as well as the addition of a souped-up GT model in 2010, Â Mitsubishi has kept this crossover up to date with things like soft-touch surfaces, newer information screens, as well as improved proportions and details. The Evo-influenced shark-like front end helps bring its style into the new millennium. A compact crossover SUV, the Outlander is categorized by its interior space, having something in common with mid-size SUVâ€™s. A third-row seat has been added (yet, does not receive the leather seating surfaces of the front and second seat. A funny place to skimp, we think. However, it remains too small for most adults, although fitting for children. The 2013 Outlander is available in several models, including ES 2-WD (I4, 2.4-Liter, FWD, $22,695); SE 2-WD (I4, 2.4-Liter, FWD, $22, 995); SE 4-WD (I4, 2.4-Liter, $25,495); and GT 2-WD (3.0-liter V6, FWD, $26,595. The SE models equipped with 4WD include a locking center differential, while the Outlander GT model gets a version of the all-wheel-drive system out of the Lancer Evolution and Ralliart models, complete with a user-selectable traction program with choices between Tarmac, Snow, and Lock traction modes. It is a sophisticated, road-oriented system with an Active Front Differential and electronically-controlled center differential, which allows for an almost uninterrupted flow of torque around tight corners. In its GT form, the Outlander’s hydraulic steering system also remains one of the best among crossovers. The front seats in the Outlander GT are comfortable and supportive. Legroom for adults is ample and climbing in/out of the second-row seats is manageable. The second row bench seat is mounted on tracks and slides to increase legroom or cargo space. A unique ‘clamshell’ tailgate, with a smaller portion that folds downward supports more than 400 pounds for loading or sitting. One can count on plenty of cargo space (73 cu. Ft.) when both rear seats are folded down, making it easy to transport a bicycle or cargo. EPA Fuel Economy: 19/25 mpg., average 21 mpg. 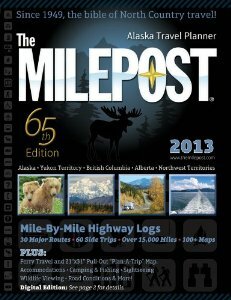 Again, we are reviewing the largest book ever on the Alaska Highway (Denali) and northwestern Canada and its environs (and on any bookshelf), The Milepost. With some updates, the new 2013 version is every bit as comprehensive and invaluable as it has ever been. We reiterate: Anyone traveling to Alaska cannot make this trek without The Milepost in tow. There isnâ€™t anything it does not contain and even with todayâ€™s ability to quickly connect to Google, one still needs a good navigation guide such as this. Since 1949, The Milepost has been guiding visitors and adventurers alike along the Alaska route and up through Canada. This is a trip of a lifetime and I donâ€™t know how my friend and I would have survived without our trusty copy of The Milepost years back. At the time of our trip in 1972, our copy was a 9×12 paperback. Not nearly as voluminous and packed full as todayâ€™s edition. Nevertheless, it was a must. I still have my old Milepost, with its dog-eared pages and notes I made back when. I look at it from time to time to jog my memory and take me back. Covering some 14,000 miles of road, The Milepost lists detailed descriptions of all the communities along the route, a mile-by-mile log of all Northern routes and attractions in both Alaska and northwestern Canada. When traveling the Alaska Highway, we found these logs extremely helpful; particularly, when in need of a fuel stop and/or eating establishment. We had our camping sites scheduled ahead of time, which helped, but referred to The Milepost time after time when searching for suggestions about where to stop. As I did before traveling in Alaska, The Milepost recommends all travelers carefully plan their itineraries ahead of time. For instance, if you are traveling in a good size RV, you will find there are extended parking areas available most everywhere along the way. Travelers can also combine road travel with the Alaska state ferry system and the Alaska Railroad. We canâ€™t recommend it enough. Toyota, Honda and Nissan are recalling more than 3 million vehicles globally for an identical problem with passenger side air bags whose inflator may burst, sending plastic pieces flying. No injuries have been reported thus far, and the recall for air bags made by Japan’s Takata Corp. affects other automakers including non-Japanese manufacturers. Details were not given. Toyota Motor Corp. is recalling 1.7 million vehicles, with some 580,000 in North America, another 490,000 in Europe and 320,000 in Japan, and include models Corolla, Tundra and Lexus SC, produced between November 2000 and March 2004. Honda Motor Co. is recalling 1.1 million vehicles; about 680,000 in North America, 270,000 in Japan and 64,000 in Europe. The models include the Civic, CR-V and Odyssey.The recall extends to Latin America, China, other Asian nations, the Middle East and Africa. Nissan Motor Co. recalled 480,000 vehicles globally, some 137,000 of them in Japan, for the air bag problem. Recalled models in Japan include the Cube, X-Trail, Maxima and Teana, made from August 2000 to January 2004, spokesman Chris Keeffe said. The problem appears to be related to human errors during production. A worker forgot to turn on the switch for a system weeding out defective products and parts were improperly stored, which exposed them to humidity, according to Honda spokeswoman Akemi Ando. According to Japan’s Transport Ministry, the recall affects nearly 732,000 vehicles in Japan. While hybrid vehicles still only account for 3.3 percent ofÂ new vehicle purchases, plug-in hybrids fare even Â poorer in automotive sales. This writer often encounters questions from consumers about buying hybrid/electric, and often doesnâ€™t give a very encouraging response. Still not sold on these vehicles, this writer prefers a good old gas engine, and the attending power that comes with it. However, a week spent in the Ford C-MAX Energi might change my mind. What a great car. Comfortable, eye-appealing and packed full of goodies, this little 4-door wagon-style vehicle rides well, is quiet and who can knock the fuel economy? Gas or electric. With a combined 100 MPGe, rated at108 MPGe city/92 MPGe Hwy, this plug-in hybrid brand has a range of 21 miles in electric alone. The overall range is 620 miles, 80 more than the Toyota Prius plug-in. Chevrolet Volt has a range of 38 miles. Charging the C-MAX takes 2.5 hours, using a 240-volt charger. The C-MAX Energi is part of Fordâ€™s broad sweep to win the fuel economy game, with products that range from EcoBoost gasoline engines to conventional hybrid, plug-in hybrid and pure electric models. While Nissanâ€™s Leaf and Toyotaâ€™s Prius use custom architecture, Ford has built a well-developed hybrid hardware into their existing products for manufacturing flexibility and competitive retail pricing. Perhaps a little late to the market, the Ford C-MAX Energi does have some competition, namely the Chevy Volt, Toyota Prius (plural), Ford Fusion hybrid and Honda Accord Plug-in hybrid. The small group of buyers willing to spend upwards of $30,000 for a vehicle that may/may not save the environment have for the most part, purchased their electric/hybrid/plug-in already. In addition, there are some conventionally gas-powered sedans that bring in 40-mpgâ€™s, are probably a lot more comfortable and versatile, and cost less, in some instances. Purchasing a Ford C-MAX Energi will yield a $3,750 federal tax credit (cheaper than the Prius or Volt). This is the first hybrid plug-in this writer would even consider. At least it looks like something, offers a lot for the money and can be driven anywhere, not just utilized as a commuter. In California (and other states), notes C. J. Oâ€™Donnell, Fordâ€™s group marketing manager for electrification, the C-MAX has HOV lane access for car-pooling. 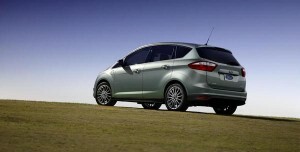 Ford unveiled the Ford C-Max Energi plug-in hybrid and the C-Max Hybrid at the 2011 North American International Auto Show. Like the conventional C-Max, the C-Max Energi and Hybrid are five-seat only. These offerings have replaced the Ford Escape Hybrid and Mercury Mariner Hybrid. The C-MAX is Ford’s first hybrid-only line of vehicles. Both the plug-in and hybrid version designs are based on the European gasoline- and diesel-powered versions. Drivers of the new C-MAX agree that driving this little compact has created some enthusiasm aimed at hybrids. Its European roots are evident when one attempts to move into traffic, or navigate a ramp. Its rack and pinion steering is nicely on-center and the four-wheel disc brakes react in concert with the electric regeneration to stop this 3,899-pound car. Fordâ€™s 2.0-liter, 141 horsepower gas engine overcomes the C-MAX Energiâ€™s battery weight penalty, With 188 hp., acceleration under electric power is reasonable. And with both engine and motor lit, the C-MAX feels as responsive as Fordâ€™s Focus. Seating up front is comfortable, and Â materials sourced from recyclable materials are of good quality. Rear seating, although not the largest, is adequate for most passengers. Cabin noise is acceptable and most times makes for a fairly quiet ride. Thereâ€™s plenty of headroom for all adults. The C-MAX fits into the wagon utility category which means it offers decent cargo capability. Â The lithium-ion battery takes up almost half the space behind the rear seats. Fordâ€™s new automatic tailgate, is actuated with a foot wave under the bumper. Neat! Â Among other options is self-parking for those challenged by moving a compact wagon into place. We see the C-MAX, like Chevyâ€™s Volt, as more than a commuter car. Relatively inexpensive to operate, a range of 620-miles on a 14-gallon fill-up sounds pretty good today. Somewhat of a stand out from other hybrid plug-ins, we think the C-MAX has much more to offer (spoken by someone who really isnâ€™t sold on the electric, hybrid vehicles). For the North American market, the C-Max Hybrid is assembled alongside the 2012 Focus and Ford Focus Electric at Ford’s Wayne plant in Michigan. The C-Max Energi will also be assembled in Michigan. All European versions will be built in Valencia, Spain. The C-Max Hybrid was released in the United States in September 2012 as a 2013 model year, follow by the released of the plug-in Energi version by mid October 2012. Engine: 2.0-Liter ATK INSON Cycle I-4, IVCT DOHC engine, 141 hp., 129 lb. ft torque, 88kW electric motor, Combined hp rated at 188. 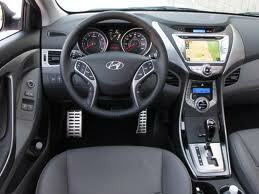 The 2013 Hyundai Elantra coupe is a very comfortable riding car and unexpectedly driver friendly. This writer has often shared praise for the Hyundai products, particularly the compact Elantra which when driving the sedan last, managed to provide over 40+ mpg on a trip to Indianapolis. That in itself was impressive. Our test vehicle came equipped with several standard features, as well as two options, including the Technology Package (navigation system w/7-inch screen, rea rview camera. 360W premium audio w/digital external amp, automatic headlamps, proximity key entry with electronic push button start and dual automatic temperature control w/clean air filter, $2,350; and carpeted floor mats, $95. We drove the Elantra coupe SE PZEV version of the coupe. There are two trim levels available in the 2013 coupe: GS and SE. Top-of-the-line, the SE version comes with a sunroof, 17-inch wheels, rear spoiler, sport-tuned suspension, leather upholstery, leather-wrapped steering wheel/shift knob and aluminum pedals. The GS version is also fairly well equipped with standard 16-inch alloy wheels, foglights, heated mirrors, full power accessories, tile/telescoping steering wheel, cruise, air-conditioning, height-adjustable driver seat, heated front seats, Bluetooth and 6-speaker sound system with CD player, Satellite radio and USB/iPod. The optional Technology package-which our vehicle had-includes, as noted above, several high-tech features directly aimed at the younger set. Performance isnâ€™t a strong point of the Elantraâ€™s 1.8-Liter engine with only 145 horsepower. You may not want to try and pass other vehicles unless youâ€™ve got miles of road ahead, and getting out into traffic is a tad laborious in the Elantra. Too bad because this is a great-looking little coupe and offers a lot else. Perhaps the six-speed manual might provide a little more push. A slight hesitation upon acceleration was also felt at times. When introduced in 2010, Elantraâ€™s coupe was a novelty, and offered looks other compacts did not. Although identical to the Elantra sedan, the coupe offers a sporty look and feel and appeals greatly to the hi-tech set of drivers out there. While the 1.8-liter engine is a smooth running engine, providing respectable fuel economy, it just lacks enough pizzaz to excite. Pricing for the Elantra coupe runs $17,595-$19,895, depending of course, on options. Our test vehicle came in at just over $23,000. The list of standard features is long and includes several creature comforts: traction/stability control, tons of airbags, ABS, cruise, decent sound system, power sunroof/doors/windows/mirrors, steering wheel mounted cruise/audio/phone controls, leather-wrapped steering wheel/seating/shift knob, heated front seats, and a full tank of gas! Competitors to the Elantra coupe include Scion tC, VW Beetle, Honda Civic coupe, and Kia Forte Koup. Not really â€˜sportsâ€™ cars, the competitors have more powerful engines than the Elantra. This writer prefers the Elantra sedan, however, the coupe is surprisingly roomy. It feels spacious with ample head and legroom. After driving sedans, it takes some getting used to opening/closing the coupeâ€™s heavy, big doors. Trunk space at 14.8 cubic feet is also ample. The gauges, speedo and tach are easily read and sporty looking. Controls are easily reached and workable. Interior appointments are of average quality. MSRP: $20,745; total vehicle price $23,965; destination $775. EPA fuel Economy: 28/38 mpg. Average 31 mpg. Warranty: 5-yr./60,000-mile New Vehicle; 10-yr./100,000-mile Powertrain; 7-yr./unlimited-mile Anti-perforation; 5-yr./unlimited-mile Roadside Assistance. Hyundai/Kia have announced a major recall of 1.9 million vehicles, due to problems with airbags and brake light switches. Most of the lineup is affected by these problems, and includes 2007-2011 model years. 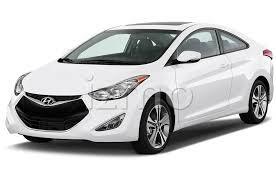 Also, 194,000 2011-2013 Hyundai Elantras are involved. Not only are the airbags involved, butÂ a faulty switch whichÂ can stop the brake light from illuminating when the driver presses on the accelerator pedal. Also affected is the cruise control system. The switch may not turn off when the driver steps on the brake, and push-to-start buttons may not work. A feature on the vehicle that stops the driver from shifting out of park without a foot on the brake may also fail. According to a report from the NHTSA, “failure to illuminate stop lamps during braking or the inability to disengage the cruise control would increase the risk of a crash.” So far there have not been any crashes or injuries related to these possible failures, and the malfunctions do not occur all the time. The performance of the brakes is not affected. The Elantra airbag recall involves a support bracket that may break loose when side airbags are inflated and could cause injuries. NHTSA began investigating the problem last year and traced it to cars that were equipped with dimming rearview mirrors installed after they arrived here inÂ U.S. ports from South Korea. When the mirrors were installed it is possible the technician may have dislodged the bracket. Dealers will install industrial adhesive strips to keep the brackets in place, at no cost. Owners will be notified and dealers will replace switches free of charge. Kia owners will receive notices in May, while Hyundai owners can expect to hear from the manufacturer in June.